The books and charts by Clarence Larkin have been extremely helpful to Christians since they were first published over 75 years ago. They have passed into the public domain and we are making some of the charts available here as an aid to Bible study. Larkin’s charts are well thought out and Scriptually sound. Some of the more detailed are books in themselves. They reveal Larkin’s vast knowledge of the Scriptures and phenomenal grasp of prophecy. 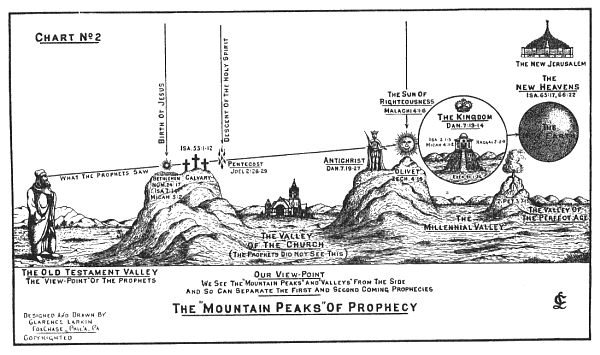 Practically all of the “prophecy teachers” today got their basic knowledge of prophecy directly or indirectly from Clarence Larkin and C. I. Scolfield. Larkin’s works, as well as Scolfield’s, are definitive; works that will endure until Christ’s return. No other books since these of Larkin, published over 75 years ago, have much improved on them. PreservedWords.com was the first website to post any of Clarence Larkin’s charts or books on the Internet. The charts below were placed online in 1998 and have been copied thousands of time by others. Good, the more these valuable charts are spread about the better. Click a title below to view a chart. Right-click to download. To have a complete collection of Larkin’s books and charts, see our Larkin Book Bundle offering. This chart shows the different positions of the “church” in the Bible.